Although the Queensland Islands are often considered a family friendly holiday destination thanks to their stunning location, fantastic range of activities and enviable position on the Great Barrier Reef in the heart of the Whitsundays, there is also a very grown up side to this holiday destination and that is no better displayed than at the adults only Queensland Island resorts. 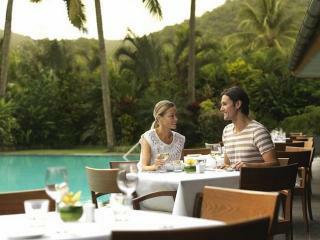 Offering a level of style and sophistication to appeal to more mature tastes, these adults only Queensland Island resorts are the perfect escape with someone special and are particularly popular for weddings, honeymoons and special occasions such as wedding anniversaries and milestone birthdays. Adults only Queensland Islands resorts are the perfect place for a romantic escape and offer a more intimate atmosphere than many of the full service and family resorts. Still enjoying all the same great facilities, these adults only Queensland Islands resorts offer a unique level of luxury undisturbed by the exuberance of noisy children. Allowing you to truly relax, these adults only Queensland Island resorts free you of the responsibility of constantly meeting the demands of little ones and allow you to really unwind. Rated 5 stars, the resorts are located on some of the region's most beautiful islands including Hamilton Island, Long Island and Lizard Island. Long Island's boutique retreat Elysian Retreat is only accessible by private helicopter transfer and does not permit guests under 16 years of age. 5 star Lizard Island Resort offers a slightly more relaxed policy, allowing guests 9 years of age and older to stay at the property.